November 01, 2017, Rybinsk. - A meeting between Viktor Polyakov, Deputy General Director - UEC-Saturn Managing Director, the Saturn participants of the 19th World Festival of Youth and Students in Sochi and the participants of the upcoming National Competition of Cross-Industry Jobs in High-Tech Industries according to the WorldSkills Hi–Tech methodology in Ekaterinburg took place in PJSC "UEC-Saturn" (a part of United Engine Corporation, a Rostec State Corporation company). The 19th World Festival of Youth and Students was hold on October 14-22, 2017 in Sochi; according to official data its participants number more than 20 thousand people aged 18 to 35 from 186 countries. 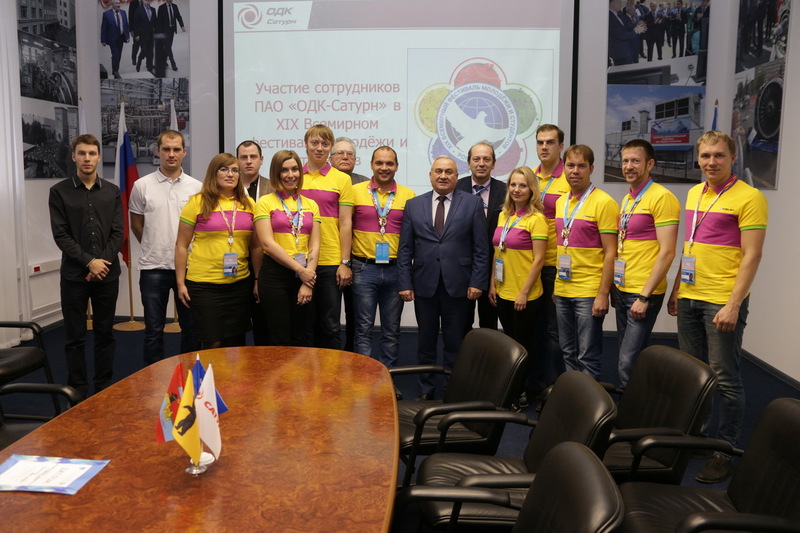 16 Saturn representatives had the luck to take part in the festival within the United Engine Corporation delegation and the youth team of the Yaroslavl Region. The meeting with Victor Polyakov was of informal character: speaking about the brightest moments of the festival, the participants of the youth forum shared their impressions, and demonstrated the best photos. For Artem Tikhonov, Oleg Rozin, Ekaterina Zaitseva, Igor Barulev, Artem Sergeev - leaders and initiators of the Youth movement in PJSC "UEC-Saturn", the participation in the festival is first of all an invaluable experience of hosting huge events. This experience can be translated to corporate projects. Artem Tikhonov, Head of Social Department, PJSC "UEC-Saturn", a participant of the festival, says: "The event was a global one, the number of participants was fantastic. However the process of coordination was established rather quickly. I would like to make specific mention of the work of five thousand volunteers creating a kind and dynamic, warm and amicable atmosphere for all the activities, so the principal goal of the festival - unity of nations - was mainly achieved." Andrey Svettsov took part in the academic program for students and young specialists "Industry 2030". Mariya Gryaznova, Kirill Vinogradov, Aleksandr Sobolev, Vladimir Syrov, Yuliya Sekretareva, Aleksandra Semkina participated in the academic program and debate "Aviation of the Future". Vasily Bogdanov, Dmitry Karelin, Maxim Burov, Leonty Sergienko were invited as experts: lecturers and speakers of the panel discussions within the "Aviation of the Future" program. A future aviation development concept was presented to the President of the Russian Federation Vladimir Putin as a result of this work. On the whole this platform involved more than 300 people from Russia, China, India, Iran, European and other countries. However, the young representatives of the Rybinsk enterprise pointed out that they had felt pride in their home company and home country many times in the course of the festival. Vladimir Syrov, Head of Process Department, shop 7, PJSC "UEC-Saturn" says: "I have been impressed by the speech of the Minister of Industry and Trade of the Russian Federation Denis Manturov on the global trends and advanced technologies in the development of industry - his detailed awareness of the situation at certain enterprises, his ability to single out key problems from a considerable amount of information, to communicate with an audience easily, in English too. His speech better improved my vision of the Ministry’s and its leader’s role. They, in cooperation with our industry, do the same big job". Vasily Bogdanov, an expert of Advanced Development and Experimental Research Design Department, PJSC "UEC-Saturn", emphasized that "what was felt during the festival is its worldwide scale. And, of course, the powerful energetics of the young set a specific pace to the festival." Viktor Polyakov, Deputy General Director - PJSC "UEC-Saturn" Managing Director says: The young’s goal-directed activity vividly demonstrated by the World Festival of Youth and Students provides a kernel for all of us - it is the environment to bring up new leaders of our enterprise as well. You are spokesmen of the corporation. I would like to wish you and all of our youth to keep your pride in "Saturn" and your responsible attitude to our complicated work". The 4th National Competition of Cross-Industry Jobs in High-Tech Industries according to the WorldSkills Hi–Tech 2017 methodology is to take place on November 2-7, 2017 in Ekaterinburg. PJSC "UEC-Saturn’s specialists Aleksandr Venikov and Egor Tekotov will represent United Engine Corporation within the Rostec State Corporation joint team at the national competition in "CNC turning" and "CNC milling" competences; Sergey Dmitriev and Nikolai Sokov will take part as experts. Addressing the young workers - participants of the national competition with words of encouragement, in one of them, Egor Tekotov, Victor Polyakov recognized a grandson of Yuri Tekotov, one of the plant's senior employees. "This is already a dynasty! Your grandfather was a remarkable professional, - said Viktor Polyakov, - he was working in the test shop all his life. We all must be peculiarly grateful to those plant people who work in production, in shops. It is hard, not always visible, but fundamental work. Everyone should remember that, but first of all you, young specialists, who are growing up today and are successfully engaged in the processes of solving practical tasks in the key fields of implementation of the UEC strategy." PJSC “UEC-Saturn” is an engine-manufacturing company specialized in the design and development, production and after-market support of gas turbine engines for military and commercial aviation, power generation and gas compression as well as for ships and vessels. PJSC UEC-Saturn is part of United Engine Corporation (JSC) and is the leader of the Commercial Engines division, a business unit of UEC. PJSC UEC-Saturn is a member of Russia’s Mechanical Engineers Union, an All-Russian industrial association of employers. The Yaroslavl regional division of the All-Russian public organization ‘Russia’s Mechanical Engineers Union’ is headed by Viktor A. Polyakov, PJSC UEC-Saturn's Managing Director. Rostec State Corporation is a Russian corporation established in 2007 in order to facilitate the development, manufacturing and export of high-technology industrial products of military and commercial application. The corporation comprises 700 companies, which form 11 defense-industrial and 3 civil industry holdings as well as 80 direct control companies. Rostec’s subsidiaries are located in 60 regions of Russia and deliver their products to over 70 countries worldwide. The Rostec portfolio spans such renowned brands as AVTOVAZ, KAMAZ, Kalashnikov Concern, Russian Helicopters, VSMPO-AVISMA, Uralvagonzavod and others. Rostec's consolidated revenue reached 1 trillion rubles in 2016. Rostec's consolidated net revenue reached 88 billion rubles, and EBITDA reached 268 billion rubles in 2016. The corporation's average salary in 2016 amounted 44 000 rubles. Following Rostec's new strategy, the major objective of the Corporation is to ensure the technological advantage of Russia at the competitive world markets. The implementation of a new technological wave and digitalization of Russian economics are among Rostec's tasks.